Can’t Find the Answer Here? The credit card processing system has been carefully set up to insure that all parties involved will be able to take advantage of this efficient way of doing business. The credit card authorization process is basically the same whether your business actually swipes or inserts the credit card through the credit card terminal, keys in the credit card on the pad of the credit card machine, or accepts the consumer’s credit card online. The main difference is the variable levels of security involved with the different ways to process credit cards. The following is a step by step explanation of how credit card processing works. This entire process takes place in less than ten seconds. If the merchant is a mail order/telephone order company, either scenario can be used for credit card processing. If the merchant uses credit card processing hardware, instead of swiping the credit card or inserting the EMV chip through the credit card terminal, they can key in the information. If the merchant prefers to use software for credit card authorization, then this can be done using a virtual terminal. A virtual terminal will allow the merchant to process credit cards over the Internet by securely logging in through the gateway provider and imputing the credit card processing criteria manually. After the credit card authorization and the goods and services are rendered, a credit card deposit goes into the merchant’s account and a debit to the cardholder’s credit line is applied. With COCARD’s credit card processing service, this will happen in no more than 72 hours. Usually the authorization and deposit happen at the same time. But, if for some reason the goods/services are delivered at a later date, then the merchant services account must conduct a separate deposit transaction. A credit card sales draft must be completed and imprinted for all credit card sales. The credit card sales draft is a legal and binding contract and serves to protect all of the parties involved in the credit card processing system. If the consumer’s credit card is swiped or inserted through a POS credit card terminal, then the credit card printer should print out a hard copy of the credit card sales draft . If you are a mail/telephone order or Internet based company, your credit card sales draft will be electronically produced. Merchant has to manually punch in the credit card number, expiration date, etc. Chargebacks are rare, but they can be damaging to your merchant services account. Any fees for credit card processing or charges for supplies for credit card equipment will be debited to the merchant services account on a monthly basis. Also, each card association will send out a monthly statement. The discount rate is a percentage of each credit card transaction that is charged to the merchant services account by the credit card processing company. The discount rate varies depending on each merchant services account. Higher risk merchant services accounts have higher discount rates. For example, there are swiped credit card rates and keyed credit card rates. Swiped rates are for storefront merchant accounts that physically handle the customer’s credit card, such as swiping it through the credit card terminal or inserting the EMV chip. This form of credit card processing is less susceptible to fraud so it carries the least expensive discount rate. The discount rate for this type of merchant services account, because of the risk involved, will be slightly higher. Rates have declined over the years as technological advances have made credit card acceptance more efficient and less susceptible to fraud. The first credit cards issued were Diner’s Club cards for use in New York City restaurants, and then Visa popularized credit card acceptance. In the beginning, there were no means of protecting merchants and issuers from fraud. A consumer would go into a place of business, present their credit card, and the merchant would go to a magazine-like publication to determine if that credit card account was legitimate. With the advent of the magnetic stripe and electronic data capture, the ability to detect fraudulent activity and delinquent accounts was greatly enhanced. The reason for the difference in rates is because the merchant services account receives payment from the credit card processing company before they receive anything. The credit card processor is taking a risk, trusting that the merchant will provide the goods and services that were promised when the credit card transaction took place. A merchant account’s discount rate can be negotiable if the volume of credit card transactions warrants special attention. Be aware that a lower or higher discount rate is not a good indicator of the quality of service from a credit card processor. Always investigate all aspects of a credit card processing company, and never go with someone just because they have low rates. The transaction fee is a separate charge from the discount rate. Once your merchant services account is approved, your credit card equipment will be programmed and shipped. All credit card equipment will be shipped by ground unless other arrangements are made by the merchant. Customer service on credit card processing equipment and credit card processing software is available 24 hours a day, 7 days a week. Your hardware replacement will be dependent upon the manufacturer’s warranty. COCARD Merchant Services stands behind all of its credit card equipment manufacturers by offering free replacement for as long as you process credit cards with COCARD Merchant Services if there is a defect from manufacturing. COCARD Merchant Services will overnight replacement equipment and repair and return your credit card equipment. 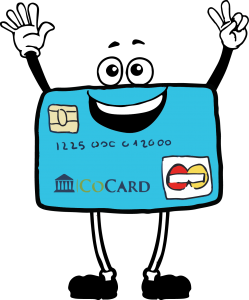 Supplies needed for credit card equipment such as paper, ink ribbons, drafts, etc., are available through COCARD Merchant Services. What is a merchant account and why do I need one? If you have a retail, restaurant, mail-order/telephone-order or e-commerce business that wishes to accept credit cards directly as a form of payment, you need a merchant account. A merchant account allows a business to accept credit cards, EMV, debit cards, gift cards and other forms of payment cards. The merchant account provider handles the transfer of funds between the customer making a purchase and the merchant providing goods or services. This is also widely known as payment processing or credit card processing. I already have a terminal. Can I still use it? If you have existing equipment, we can often reprogram your current terminals so that they can be used with your new processing account. What are my monthly fees? COCARD prides itself on honest, straightforward pricing and competitive rates. We assess a Statement Fee and a low monthly minimum; we do not charge our merchants batch fees or annual fees. No, COCARD does not charge an application fee. When will I know if I’m approved? COCARD Merchant Services has a 98% approval rate on merchant accounts, and our goal is to get you accepting credit and debit cards as quickly as possible. Usually, approvals take place within 24-48 hours, but delays can occur if our underwriting department needs more information about a business. Your account manager will stay in touch with you throughout the application and setup process and will work with you to resolve any issues with your application. Can I use my existing bank account? Absolutely. Your funds will be deposited directly into your local business account, allowing you to maintain your current banking relationship. Chargebacks occur when a customer disputes a charge on their credit card statement. These are commonly due to unauthorized purchases or dissatisfaction with a product or service. Merchant banks issue chargeback fees to cover the retrieval of information in the dispute; if it is determined that the customer has a valid claim, the customer will be refunded and the merchant’s account will be debited. Is it better to run debit as an online or offline transaction? Whether it is more beneficial to run a debit card transaction as an online or an offline debit varies depending on the type of merchant account and on the amount of the ticket. Generally, online debit is more cost-effective with higher ticket amounts; however, the more that ticket amounts climb, the more likely customers are to pay for purchases with their credit cards. Also, if merchants have PIN pads out on their counter, more customers will run their cards through using their PINs on low-ticket, higher-cost transactions, negating the benefits of the lower prices on the bigger ticket items. Do I have to wait for my monthly statement to see my transactions? No, COCARD can access reporting features online for real-time transaction histories and other account information. How much are interchange fees? Interchange fees, which are posted on the Visa and MasterCard websites, range from less than 1 percent to 3 percent plus a per item fee for various transaction types. Rates vary based on the type of industry, the type of card used and the type of sales transaction. For example, sales conducted over the phone present a higher risk of fraud than in-person transaction, so the rates are higher. Credit cards present more risk than debit cards, and rewards cards are even higher still. Because interchange fees are the fees that the card associations charge credit card processing companies, your costs will also include additional fees from your payment processor. Visa and MasterCard set the rates for interchange. How often do interchange fees change? Twice a year, usually in April and October, Visa and MasterCard review their interchange rates and decide whether or not to revise their fee structures. Would just accepting cash be cheaper? There are expenses associated with accepting cash as well. Cash transactions carry the risk of human error or theft; cashiers must count and make change accurately, and merchants must transport deposits to the bank or use a safe. Also, accepting credit card payments can increase sales by enabling customers without cash to make purchases. Reputable credit card processing companies allow you to reduce your costs and enjoy the benefits of processing credit card payments. How much does it cost to implement an EMV- capable terminal? 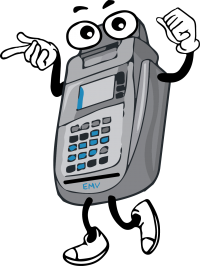 EMV card readers cost between $400 and $700 but are often discounted through payment processors such as COCARD, where it might even be free. A processing gateway is a web-based service that authorizes payments for e-businesses and online retailers as well as brick and mortar businesses. Do I need to buy any equipment? This depends upon your business type. Many COCARD customers process payments through a virtual terminal, using only a computer and internet connection. If you do need to purchase a Point of Sale system, credit card machines or other equipment, COCARD’s dedicated account managers will work with you to determine your business needs and recommend the best solutions. COCARD charges extremely competitive rates. If you are currently processing credit cards and would like a complete complimentary rate analysis, we’ll ask you for three months of your current processing statements. Once I’m approved, how do I actually start accepting credit cards? Getting started is easy! A member of the COCARD support team will walk you through setup and run a test transaction. Are there toll-free numbers available for authorizations and settlements? What are those hours? Yes, toll-free numbers for authorizations and settlements are available 24 hours a day, seven days a week. How can I avoid chargeback fees? With mail/telephone orders, get the name and phone number of the cardholder and tell them that you will contact them before goods/services are delivered. Do American Express and Discover charge interchange fees? There are no interchange fees with American Express and Discover because in both cases, the card issuer and the acquiring bank are the same thing. However, American Express and Discover both charge merchant fees, which are often substantial. What is a “liability shift” in terms of EMV? This is when liability for card fraud switched from the banking institutions to merchants. Starting October 1, 2015 businesses that have not updated their terminals to accept EMV equipped cards will now be held responsible for fraudulent swiped transactions. What’s the main difference between the cards we use now and EMV cards? Historically, the United States has been typically been using cards with a magnetic strip on the back. These cards are swiped through a card reader and contain static financial information that can be easily duplicated by card readers. EMV cards, on the other hand, contain a microchip that produces a new code with each transaction, preventing fraudsters from gaining access to sensitive data on the card. EMV cards are therefore more secure than magnetic strip cards, and are responsible for a worldwide decrease in fraud. How do I accept credit cards online? To accept credit cards online, you can process through an online gateway or directly from your website using a shopping cart. How long does it take to get a merchant account? Most submitted applications are set up within 24 to 72 hours. Why do different types of transactions have different rates? Processing fees vary based on the type of industry, the type of card used and the type of sales transaction – for example, sales conducted over the phone present a higher risk of fraud than in-person transaction, so the rates imposed by the credit card associations are higher. How do I apply? What will I need to apply? The application process is simple and takes just a few minutes. When you call 800.317.1819, one of our account managers will ask you for information about your business, including its legal name, tax ID, physical business mailing address; legal owner/principal information; and estimated card transaction information. You’ll then fax in a few pieces of supporting documentation to verify the information you have provided, and in a few days you will be ready to process! Who do I call if I have a question or problem? Call 800.317.1819 at any time to speak to your account manager. If necessary, we’ll connect you to a member of our expert technical support team. How do I get set up for Discover and American Express? When you submit your merchant application, let your COCARD account manager know that you’d like to accept American Express and Discover, and we will apply for a merchant ID on your behalf. What’s the difference between online and offline debit? With online debit transactions, customers enter a 4 digit PIN number into a PIN pad at the point of sale. The transaction is routed through the debit network rather than the Visa/MasterCard network, and the funds are immediately debited from the cardholder’s checking account. Merchants who do not have PIN Pads can still process debit cards as off-line debit transactions. Off-line debit does not use a PIN number. Transactions are processed through the Visa/MasterCard network and the funds are debited from the cardholder’s checking account. PCI Compliance refers to the Payment Card Industry (PCI) Data Security Standards (DSS) imposed by Visa, MasterCard, American Express and Discover. This is a mandatory security program from the credit card associations put in place to protect your customers’ account data, and to protect your business from serious security breaches and damages. What happens if I am not PCI Compliant? PCI compliance is mandatory for every merchant accepting Visa and MasterCard. If you are not PCI-compliant, you will have to pay monthly non-compliance fees. If you happen to experience a data security breach while not complying with the PCI-DSS standards, you would also be subject to additional fines from Visa and MasterCard in addition to the expenses resulting from the security breach. As a service to our merchants, COCARD partners with a Qualified Security Assessor/Approved Scanning Vendor who will provide quality security assessments at a low cost. How can I lower my credit card processing fees? Because interchange fees are set by Visa and MasterCard, they are not negotiable. However, you should examine your credit card processing agreement to ensure that your merchant account provider is offering you the best possible terms. You can also lower the cost of credit card processing by taking steps to eliminate the risk of fraudulent transactions – doing so will help you receive the lowest, or “qualified” interchange rates whenever possible. For example, you should always swipe a credit card during card-present transactions; if you have to key in a card, always use Address Verification Service (AVS). Be sure to batch daily as well: your credit card processor is charged a higher interchange rate for transactions that are submitted more than two days late. Another way to reduce the risk of fraudulent transactions, is by accepting EMV cards. Companies who have not adopted the EMV technology will now be held liable, instead of the banks. Therefore, by routinely accepting EMV equipped credit cards, your business can prevent losses that would be the result of being liable for a fraudulent charge. What does EMV stand for? It is an acronym for its developers: Europay, Mastercard, and Visa. How will switching to EMV directly benefit my business? EMV will benefit your business in three ways. First, the risk of chargebacks from fraudulent transactions is greatly reduced. In the past, banks bore the financial weight for fraud. Now, companies that have not adopted EMV technology will be held accountable for fraud. Adopting EMV technology will protect your business from costs associated with fraud. Second, because technology keeps evolving, it is important to keep up. Most hardware that accepts EMV will also allow your business to accept payment alternatives such as contactless pay. Third, you can accept payment from foreign visitors. Much of the world only uses EMV technology. COCARD® is a registered ISO of Wells Fargo Bank, N.A., Concord, CA. ©2016 COCARD | A-AAccess OnLine Payment Systems is a member of COCARD Marketing Group, LLC.